Summary: Dear Lucy Silchester, You have an appointment for Monday 27th July 2011, Yours Sincerely, Life. Lucy Silchester has received an appointment card. Actually, she's been invited along a few times to this appointment , but she keeps brushing the gold embossed envelope under the shag pile carpet. She's taken her eye off the ball and has busied herself with work (a job she doesn't love), helping out friends, fixing her car, feeding her cat, seeing her family and devoting her time to their life dramas. But Lucy is about to find out that this is one appointment that she can't miss. And she can't escape it either. Review: I have been hooked on the wonderful writing of Cecelia Ahern since I read PS I Love You. The heartbreaking tale of Gerry and Holly. Ever since I opened that book I have been one of Cecelia's loyal fans. 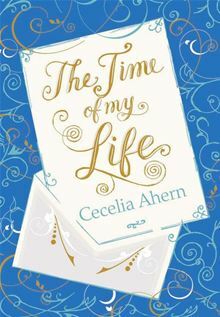 The Time Of My Life is also a very special book for me it is my very first Cecelia ARC, that I will cherish. Very early on I discover that I like Lucy, and just like many of us, she lies a little to make herself feel better. Yet, her conscience then tells the truth. The letters are intriguing and yet she is un-fazed as a reader you're on tenderhooks. What do they mean? Is this some sort of sick joke? I love the scenes with her family, a summons to find out an important matter these events make me smile and cringe. Lucy reminds me of me in some ways I'm career focussed, and she seems that way. She doesn't need a man to define her but is her life passing her by? If you received an appointment with life how would you respond? What I've loved about 'The Time Of My Life' is that it's not what I expected it to be. Cecelia's novels are so unique and I am always hooked and eager for more. If you think this is just some lovey-dovey romance then you shall be pleasantly surprised. There were so many twists and turns in Lucy's life including some action moments- which I would never have expected in a million years. I will say this book has made me think slightly differently about my own life. The way I act, what I do and to a certain extent what I say. As individuals we have to be true to ourselves and if that means putting another human beings nose out of joint so be it. Are you happy with every aspect of your life? If not how will you change? I don't read a lot of adult books but I'd never say now to a Cecelia Ahearn book!! Can't wait to get hold of this one!! I always know I'm reading a good book when I start reading extra fast, trying so hard not to skip words, or lines, or even pages because I'm dying to know what happens next. But then when I'm done, I'm left feeling bereft and sad, because I wanted it to go on for much longer.